There are several films with steampunk elements. 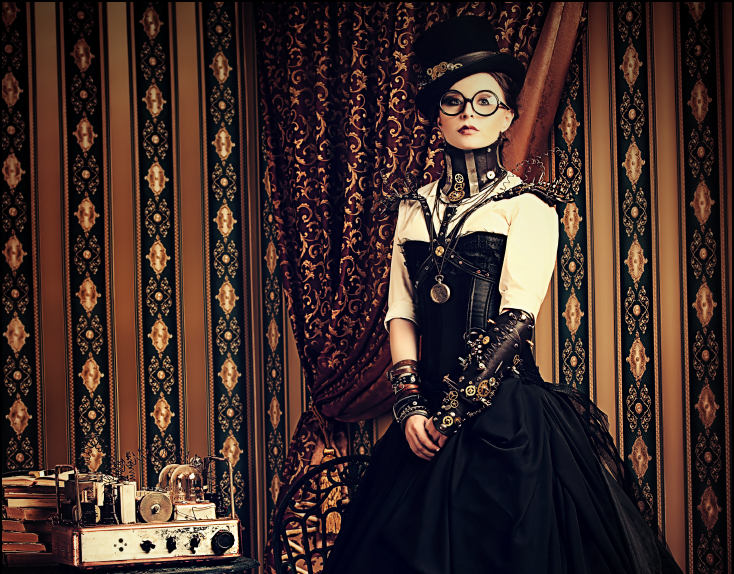 Steampunk began as a literary tradition and expanded to include fashion, art, and film. Steampunk literature started as a genre of books that combined Victorian age steam technology with futuristic inventions. The term steampunk made its first appearance in 1987 by the author K.W. Jeter as an alternative to the term cypberpunk. Jeter’s novel, Morlock Night, is inspired by 19th century settings. Steampunk fashion takes its leaf from the pages of such books as The Time Machine by H.G Wells and Twenty Thousand Leagues Under the Sea by Jules Verne. A Japanese anime, Steamboy follows the adventure of a young boy protecting an invention of his grandfather in a fantastical world. Starring Jim Carrey as Count Olaf, Lemony Snicket involves the adventures of a trio of children whose parents had died unexpectedly in a fire, leaving them orphans. They go to live with their uncle, Count Olaf, and unravel the mystery of their parent’s death. Saoirse (pronounced SEER-shuh) Ronan and Bill Murray star in this epic tale of humanity living underground. The generator that powers the city is failing. Lina, a young messenger girl, sets out to solve the problem with the help of her friend, Doon. They go on a harrowing adventure, finding out the truth that has long been hidden from the citizens of Ember, until now. Sherlock Holmes and John Watson set out to solve the ritualistic murders of young women and to save the next victim. Using his characteristic wit, Sherlock Holmes pieces the clues together with the help of Dr. Watson. A mad scientist kidnaps children in order to steal their dreams. He takes a child, Denree, whose brother, One, sets out to rescue him. One is joined by a colorful cast of characters as he attempts to regain the brother he has lost. Will Smith and Kevin Cline star in this steampunk western as James West and Marshall Gordon. They are tasked with the job of bringing in General “Bloodbath” McGrath and solving the disappearance of America’s scientists. Van Helsing is a retelling of the story of Dracula, also weaving Frankenstein’s monster and werewolves into the tale. Van Helsing sets out to defeat Dracula and his brides, who intend to use Frankenstein’s monster to bring life to their children, who are born dead. An alternate history set in 1939, Dr. Totenkopf sets giant robots loose in New York City. A reporter, Polly Perkins, is investigating the disappearance of important scientists and teams up with the Sky Captain, Joe Sullivan, to save the world from Dr. Totenkopf. 20,000 Leagues Under the Sea is a 1954 classic movie based on the book by Jules Vern. Professor Pierre Aronnax and his helper, Conseil, are hired by the United States government to find and dispatch a sea monster that has been attacking ships. The English village of Wall lies next to a magical kingdom called Stormhold. Tristan Thorn witnesses a falling star that lands in Stormhold and sets out to retrieve it in order to impress his love interest. Once he gets there, the star is in fact a young woman. He ties her up in order to bring her to Wall and sets off a chain of events involving the battle to rule Stormhold. Each of these films is a treat to watch. The notes of steampunk in the films are refreshing and vibrant, stirring the imagination and taking us along on epic tales and adventures of fantastical proportions. WhiteClouds is a 3D printing service company and we have a fantastic selection of steampunk items, including dragons, dinosaurs, jewelry, and smartphone cases. Browse our selection and indulge in your inner steampunk inventor.